Rock Band 3 Keyboard Bundle Blocked for PS3 in U.S. If you own a PS3, contractual obligations and agreements terms may have just made Rock Band 3 slightly more expensive for you. 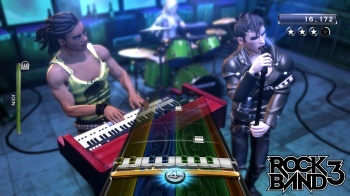 Rock Band 3 is adding keyboards to the Rock Band cocktail, but fans of the series will already have a closet full of plastic guitars and drums, so are really only going to want the game and the new instrument. Unfortunately, if you're a North American PS3 owner, that'll probably cost you a little bit more than everyone else. Harmonix has announced in a post on its official website that the keyboard and game bundle for Rock Band 3 will not be available for the PS3 in the U.S., Canada or Mexico, due to "agreement terms" for the North American region. In the statement, Harmonix says that it is working with retailers who had taken pre-orders for the bundle to see if they would be willing to offer the keyboard and the game - both of which will be available for the PS3 as standalone products - as a "soft bundle" at the pre-order price of $129.99. This will be at the retailer's discretion however, and some may choose to opt out. The difference in price is only about ten bucks, but that that's still ten bucks more than people grabbing them on other platforms. The bundle will still be available for the Xbox 360 and the Wii in North America, and will be available on the PS3 in Europe. Rock Band 3 will be released for PS3, Xbox 360, Wii and the DS, on October 26th.